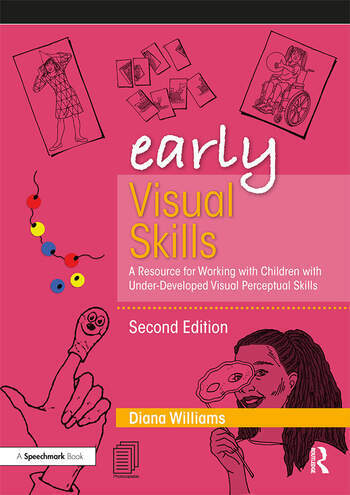 Now in a revised and updated second edition, Early Visual Skills is a practical manual for use with children and young people who have under-developed visual perceptual skills. Twelve clear and easy to follow sections; focusing on skills such as attention, discrimination, sequencing, concentration and memory; are filled with carefully designed activities to stimulate visual attention and discrimination skills in children with a range of developmental levels and abilities. As most of the activities are non-verbal, they are well suited for children with limited spoken language, including EAL learners, the deaf, sensory impaired, or those with autism or learning difficulties. Whilst primarily designed for early years practitioners, SENCOs, specialist teachers, therapists and other professionals, activity sheets and guidance for parents also provide practical advice on how to stimulate visual perceptual skills at home, turning the child’s everyday routines into opportunities to stimulate visual awareness. Diana Williams qualified as a Speech and Language Therapist in 1983, and worked in schools and nurseries with children who have communication difficulties. She developed a specialist knowledge in the field of hearing loss, and completed an MSc in Speech Therapy with Deaf People at City University, London in 1992. Her other publications include the companion volume ‘Early Listening Skills’ and the popular ‘Working with Children’s Language’. In 2002 she authored a word finding and categorisation game ‘Find the Link’ for individuals and group work. In addition to her clinical roles, Diana held a number of lecturing posts in higher education institutions, teaching and supporting a diverse range of students. After gaining a Postgraduate Diploma in Education in 2004, she provided professional development activities for other lecturers and teachers as an Educational Developer. More recently she completed a BA(Hons) in Fine Art and a MA Fine Art, and now focuses her time on arts education and arts practice.